Sometime the App-V cache on a client got corrupted. Mostly this is visible by applications that don't start anymore and it is not possible to unload the application(s) out of the cache. If there is no other way anymore to solve this, the final solution is by completely rebuilding the App-V cache. To accomplish that you need to reset the current cache. This is done by reconfiguring a registry key in HKLM hive. This is not something you would like to do by service desk personal manually, but it would be nice if you can facilitate them. Then the App-V Client Cache reset utility is a good opportunity. Within a simple GUI the client name need to be provided and the registry setting is adjusted. Logically the user needs to have local admin rights on the machine and remote access to registry. The last utility in this article is the App-V Analyzer by Login Consultant. This utility is delivered as an MSI installation file. The installation is really straight forwarded with specify the installation directory as only question during the process. The application requires a local version of Microsoft Excel and PowerShell 2.0 installed. In the application you specify the path of the content share and choose analyze. Dependent of the amount of OSD files in the content directory this process can take a while (including not responding messages). 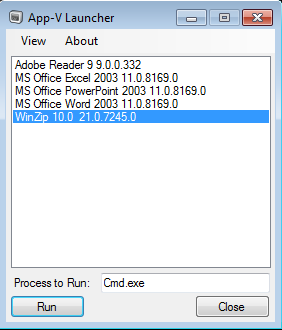 The output is an excel file with all information (characteristics) of the available OSD. It gives a quick overview with OSDs are available using which SFT packages, GUID and other information. This is already nice for documentation purposes, but the tool offers more. On several tabs the product shows interesting information like name and version conflicts, package name conflicts, GUID conflicts and Primary Directory conflicts (good trouble shooting information). Still very useful addition tooling is released for the App-V infrastructure. I personally use App-V Launcher currently as my primary tool to troubleshoot sequences. With OSDFileAnpassen you can save a lot of time when mplementing a new infrastructure based on a new OS where App-V is for a while with the OS option. Also the App-V Client Cache reset has potential for specific use cases and the App-V Analyzer is a good tool for documentation and troubleshooting purposes.